I'd love to see affordable editions of historical decks from different regions - Czech, Russian, Belgian, Turkey.... not only France and Italy. LS seem to be throwing everything at the wall and hoping something sticks, just my opinion. I wouldn't say that, seems like their marketing department has taken a few logical steps in terms of product offerings to capitalise on the commercial opportunities in the tarot sector. Yes fluorescent in a way of speaking because, if you compare it to the Héron BN which is from the first third of the XIXth century, you can easily notice that the colour scheme is in compliance with the original notwithstanding some details here and there. And stenciled colours are often eminently vivid. I had forgotten to post the new back replacing the brown one. I have not made myself sufficiently clear. The back with the octagons belongs to the new LoScarabeo. 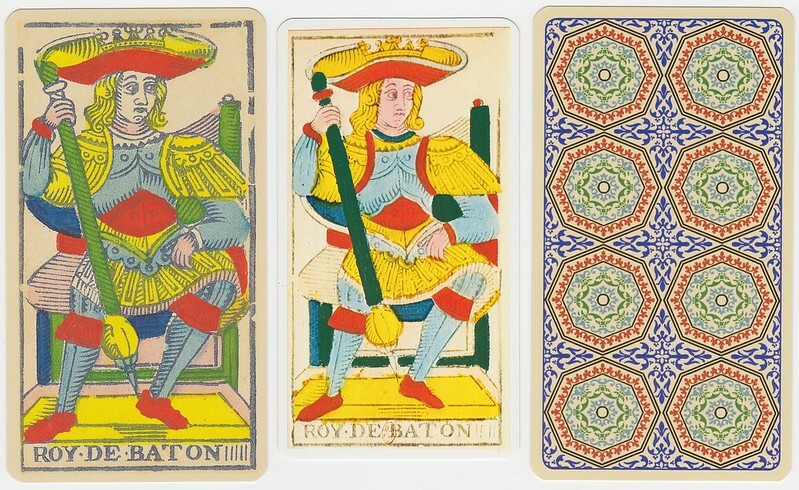 The deck is easily available from italian sellers. The Héron's smaller card I've posted is taken from the first edition (in the seventies), the only one to be rightly coloured, but out of print for decades. I still can't figure out how to find the new LoS deck, though. Alidastore doesn't seem to have it, nor LoScarabeo's store, and I really don't know how to do a search that doesn't turn up lots of irrelevant decks. Many are slightly different versions with more brownish colors.. Does someone have an ISBN or specific store in Italy that has the new version (with the title card showing copyright date as 2015)? [QUOTE=baconwaffles;4879968]Oh thank you for sharing this. I am going to check out their Facebook and the scans. Yes I second that I would really like the deck but all the decks of it out there are very pricey 79.00 and up.